This review first appeared in the October 19, 2006 issue of the North County Times. 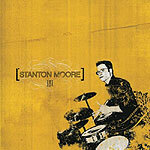 While this album carries the name of New Orleans drummer Stanton Moore, much of its deep jazz-funk groove comes from former San Diego keyboardist Robert Walter's soulful playing. And fully half the album's 10 songs came from Walter's pen. Still, it's Moore's name on the jacket, and so he gets the credit for a truly stellar set of R&B-flavored jazz fusion, New Orleans funk and old-school Stax soul. Moore, Walter and guitarist Will Bernard often seem to be channelling the spirits of long-lost Memphis soul musicians. Moore's rock-steady yet deeply swinging beat sets a perfect foundation for Walter's smooth keyboard leads and Bernard's stinging guitar. The overall effect from all this is a sound that is not too far from an updated take on Booker T & the MGs; classic '60s instrumental soul-funk with some punk and hip-hop influences sprinkled about in a very organic manner.